Love these Goal Crusher Crops! They fit really well and are opaque in a deep bed, and slightly snug and compressive. My only hesitation with them is that I worry about how delicate the mesh is and now that I’ve already seen a shared photo of these pants with a snag in the mesh, I hesitate to buy them. 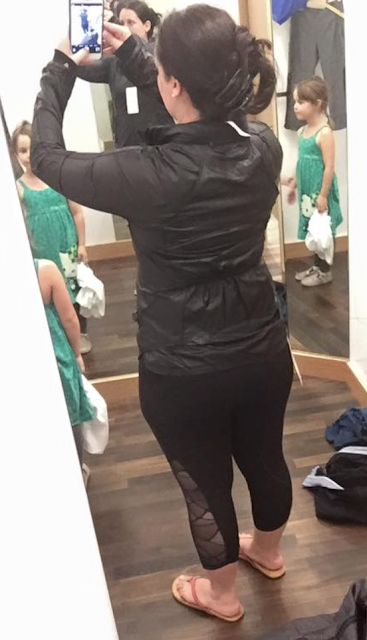 This jacket fit fine but the material is shinny looking and it feels like it would be very sticky over sweaty skin. It’s very thin nylon and has that garbage bag feel to it. The detailing on it is pretty nice though. Also opaque and really nicely contrasted with the black mesh. This tank didn’t fit loosely like I expected it to. 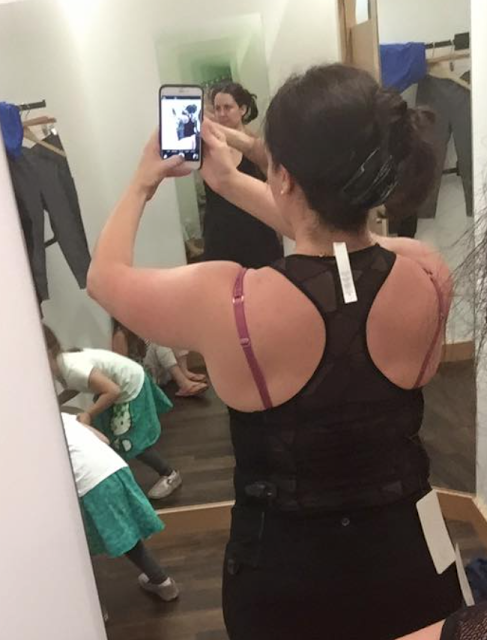 It’s quite form fitting and in such a thin material with a sheer back I didn’t like it. 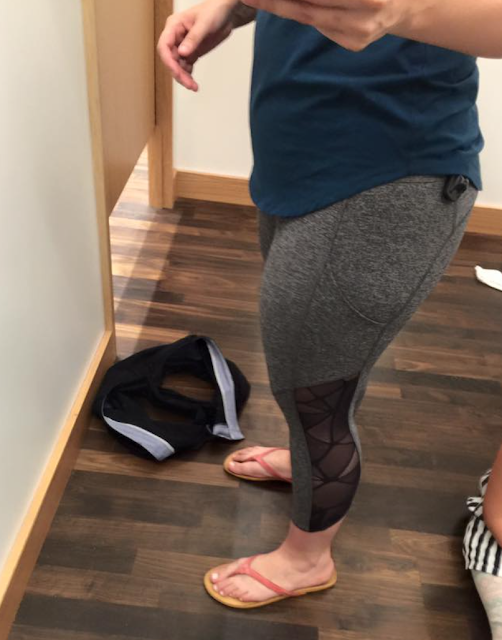 I’d definitely size up on this one if you have any lumpy areas to hide like I do. This is the photo that someone shared on Facebook of her newly detagged goal crusher crops. The mesh already has a pick in it!! "Coming This Week! Goal Crusher Jacket and Goal Crusher Crops!" "Goal Crusher 7/8 Tight, Goal Crusher Tank, City Sky Run By Short"
What type of waistband are the crops? They are a mid rise. Comfortable. whats the price on the jacket? Any other colors or just black? Hi! Sorry I didn't catch the price. The jacket comes in just black or white. 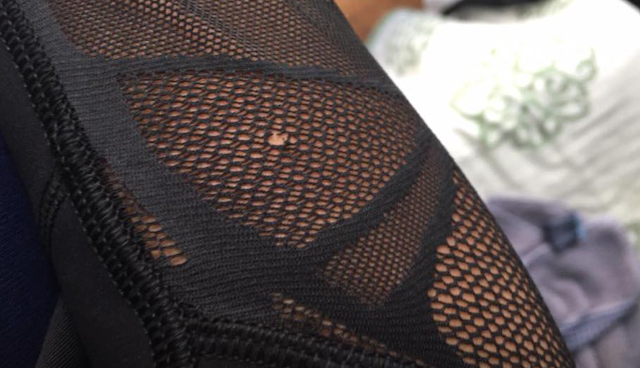 there they go ruining a perfectly good pair of tech crops with the dreaded mesh!!! they look great on you, mesh aside! I hate that mesh. Boo. I too would like to know what other colours you saw in the Goal Crusher Jacket and are those Goal Crusher Shorts? I love the colour and print but I think the inseam is 3 1/2" and I don't wear anything smaller than a 4" inseam. Your kids in the background made me smile. 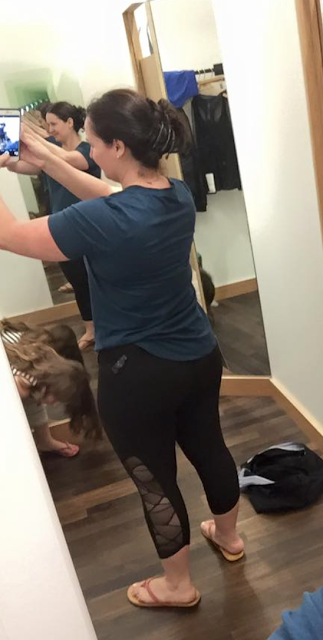 Totally how my kids are in the fitting room, behaving but wiggling around and making faces in the mirror. So cute! Hey! Sorry I dropped the ball on providing the info today. I've gotten used to doing my fit reviews when my kids are in school. The Goal Crusher Jacket came in just white and black. I didn't catch the price on it. 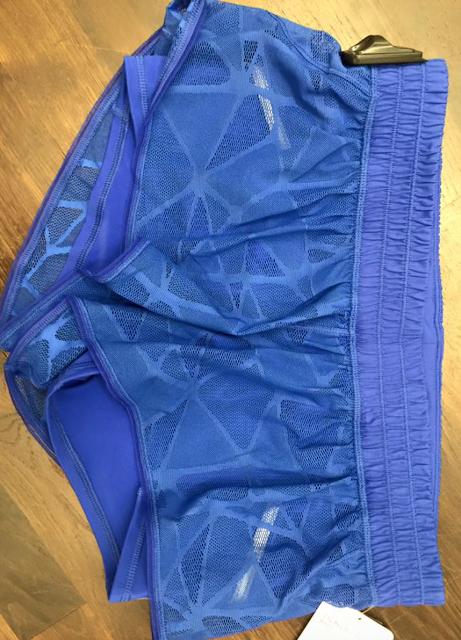 The shorts are actually not called the Goal Crusher Shorts I think but I assumed that was what they where because they have the same mesh as all the other GC pieces. They were very short. Probably shorter than Speeds but I'm not totally sure. Too short for me. lol! Thanks! 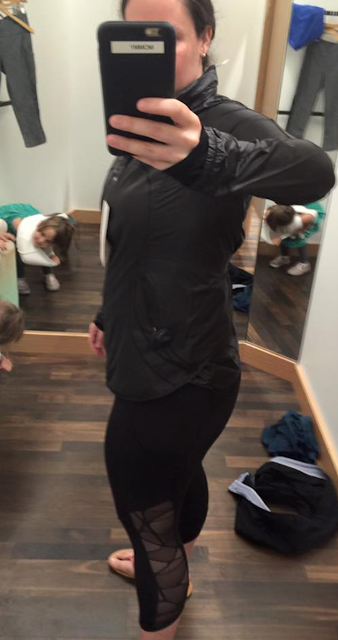 I miss them in the background of my try on photos now that they are in school and grown. 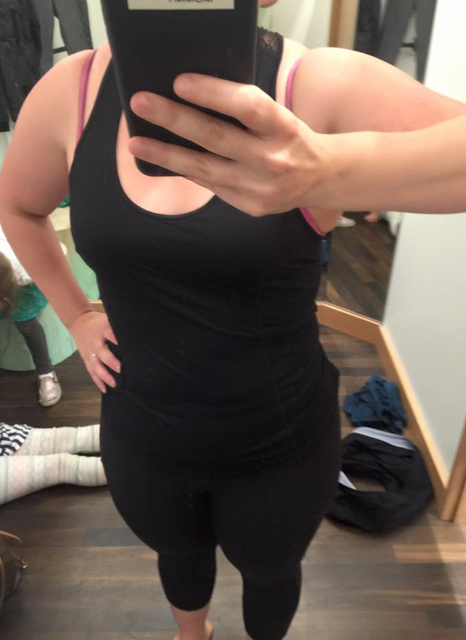 I was looking at them in my old try on photos on Sunday. In these pictures I'd just picked them up from summer school so they were especially rowdy and full of antics. Thanks Lulumum it really is nice to get this info a day ahead of the drop and to actually get to see the product and fit reviews. As for the Goal Crusher Crops, the 1990's called, they would like their pantyhose back. 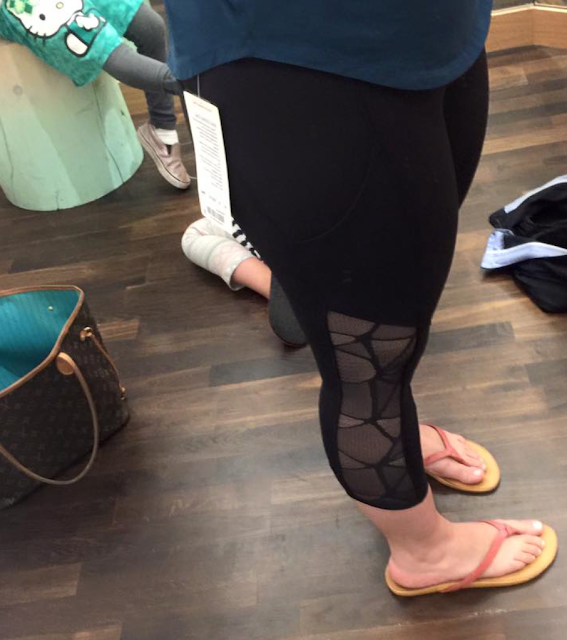 Sorry but the mesh on those crops are just begging to be snagged. I love the design of the jacket but shiney fabric is a no no and so is only having black and white. Being that we are mid-July this fabric choice for a technical jacket seems to be released a little late in the game. A mesh-lined lightweight fabric jacket is what I have been waiting for. I have been so disappointed with the lack of jackets this summer. HI could you do a review with photos of the Barbour jacket you got at nordstroms please? I also had considered the j crew waxed coat but the sizing is so off for me. I can't make my mind up..
Hi! Absolutely! I'll do that tomorrow afternoon for you. 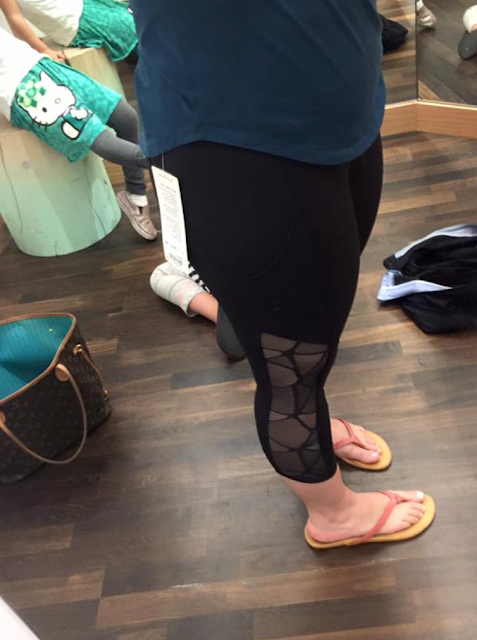 If there are a lot of lulu store photos to share I will bump the post to earlier in the day and link it here for you. I really love the jacket and am glad i got it. I wish I'd ordered the pink one as well to compare the colors but now all colors are sold out online so if you do have access to it in store, I'd grab it and make up your mind later. I've tried a barbour jacket at J Crew and the sizing was off for me. 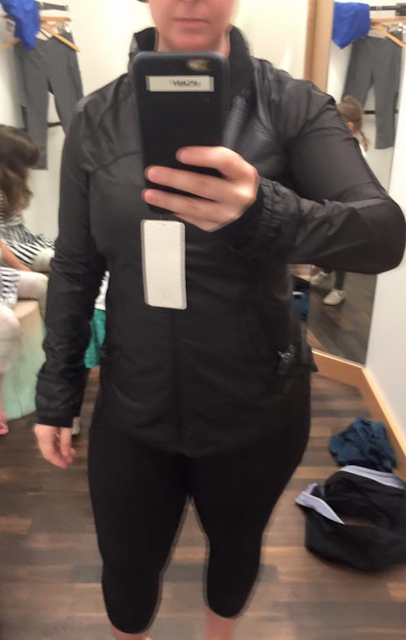 I'm a size 10 Lululemon and this Barbour jacket I got in a 12 and it's quite comfortable and roomy. *a waxed barbour coat at J Crew last year. Thanks for the review! I didn't think the mesh would be THAT fragile. Now I must pass.